Specification Display: 5.8" Super AMOLED, 2,960x1440px resolution, 18.5:9 (2.06:1) aspect ratio, 570ppi; HDR 10 compliant (no Dolby Vision) Rear camera:12MP, f/1.7 aperture, dual pixel phase detection autofocus, OIS; multi-shot image stacking; 2160p/30fps video recording Front camera: 8MP, f/1.7 aperture, autofocus; 1440p/30fps video recording OS/Software: Android 7.0 (Nougat) Chipsets:Qualcomm MSM8998 Snapdragon 835, Octa-core (4x2.35 GHz Kryo & 4x1.9 GHz Kryo) CPU, Adreno 540 GPU Memory: 4GB of RAM, 64GB of storage; microSD slot up to 256GB Battery: Non-removable Li-Ion 3000 mAh; Adaptive Fast Charging; QuickCharge 2.0 support Single-SIM (Nano-SIM). Samsumg Galaxy  S8 Dual G950FD 4G 64GB Smart Phone. Introducing the stunning Infinity Display - The revolutionary design of the Galaxy S8 and S8 begins from the inside out. We rethought every part of the phone's layout to break through the confines of the smartphone screen. 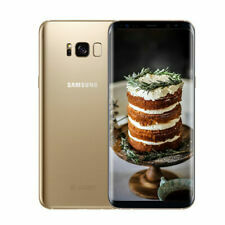 Samsung Galaxy S8 - 64GB - Maple Gold Smartphone (unlocked). Condition is Used. SMG950F Rose gold Comes with origional box, ear phones (never used), manuel etc as pictured. No charger. Handset in great condition as pictured. Always had a ghost armour screen protector and shockproof case. Still works fine but taking a little longer to charge and battery goes flat quicker than it did when brand new. Selling as I've upgraded to a new phone. Purchased outright from JB HIFI December 2017. Samsungndition is Used. Sent with Australia Post Standard Service. More details on the phone on the link below! Samsung S8 'unlocked' for sale, like new!! Only used for 6 months and the phone has a small scarf on the right hand side of the screen. Phone comes with two covers and has the latest android software installed. SAMSUNG Galaxy S8 Duos - 64GB - Maple Gold Smartphone. Condition is Used. Sent with Australia Post Pre-Paid Parcel Post Satchel 500g. 6.2” New Unlocked Samsung Galaxy S8 Plus G955F Octa-core 4G/64GB Orchid Gray. New HUAWEI HONOR 8 Octa Core Dual Sim 4G LTE Smartphone Gold 4G /64. 1X Samsung Galaxy S8 PLUS. 1X USB data cable. Toys,Hobbies. Trending at AU $477.41eBay determines this price through a machine-learned model of the product's sale prices within the last 90 days. UNLOCKED WORKING WEAR FROM USE ON SCREEN AND BACK THERE IS SCREEN BURN SEE PHOTO. No exceptions. The Samsung Galaxy S8 is the latest in a long line of fantastic Samsung mobile phones. eBay is the place to get your hands on one of these fantastic devices at an amazing price. The Samsung Galaxy S8’s 10 nanometre processor lets you use your phone for hours on end without decreasing battery efficiency. And you can boost your storage capability if 64GB just isn’t enough. Your Samsung S8 also brings you a new digital friend: Bixby. This personal assistant can chime in through voice and text commands to make your life that much easier. In addition to amazing power inside, the Samsung S8 is one of the most visually appealing mobile phones around. Pushing the limits of what a smartphone can do, the Samsung Galaxy S8 features the revolutionary Infinity Display that uses just about every centimetre of real estate on the device. This creates an immersive experience without any tricky bumps or unsightly angles. And the casing of the phone comes in black, blue, gold, grey and silver, giving you a sharp look that’s not boring. What good is a smartphone if you can’t use it to take quality photos and videos? The Samsung Galaxy S8 comes with a high-powered 12 megapixel rear camera and 8 megapixel front camera. That means you’re never far from selfies, landscapes and other embarrassing social media shots. Don’t think you have to leave your new Samsung mobile phone at home when you’re away. On eBay you’ll find unlocked handsets that keep the power in your hands all over the world. Whether it’s for work or play, a Galaxy S8 can help you take care of business, stay in touch with friends and family and give you access to the latest and greatest apps and your favourite media all in one convenient package. The wait for the next awesome Samsung mobile phone is over. Grab a Samsung Galaxy S8 from eBay today and get incredible mobile power in the palm of your hand.